In Henry Hathaway's 1969 version of True Grit, Deputy Marshal Reuben "Rooster" J. Cogburn, played by John Wayne in an Oscar-winning performance, is introduced to the audience when he helps unload a group of prisoners from the back of wagon. When one stubborn prisoner refuses to move, Cogburn knocks him off, to the delight of the crowd that has gathered to watch. It's a fun scene that sets up Rooster as a prickly rogue, but one who gets the job done. In the new adaptation of Charles Portis' novel, Rooster (Jeff Bridges) is introduced when Mattie Ross (Haillee Steinfeld) finds him occupying an outhouse, having relocated there from a saloon, and he drunkenly informs Mattie that he will be in there some time. In much the same way as Hathaway used Rooster's introduction to establish who he was, The Coen Brothers use his introduction to not only establish the character - again, he's an irascible sonofabitch, but one with a well-earned reputation for ruthlessness - but also to set their film apart from the iconic original; their version is going to be dirtier and grimier, but with a much more ribald sense of fun. However, it still follows the same basic blueprint as the earlier film, even though they hew much closer to Portis' work. After the death of her father at the hands of a man named Tom Chaney (Josh Brolin), Mattie sets out to the town of Fort Smith in order to claim her father's body and to hire a marshal so that she can chase Chaney down and see that justice is done. Upon discovering that Rooster, whilst not the best Marshal, is certainly the meanest and a man with 'true grit', she sets about getting together enough money to hire him. It's in these scenes that the film first establishes its tone. In order to get the money, Mattie has to sell back the scraggly ponies that her father bought before his untimely demise, which she achieves by talking circles around the local horse merchant, repeatedly threatening him with legal action until he is compelled to pay not only for the horses that he no longer owns, but for a couple of horses that he never owned in the first place. It's an hilarious scene but also one that subtly primes the audience, giving them a glimpse of the speed and dexterity of The Coens' directing and the casts' delivery so that they may prepare for what lies ahead. The scene also represents one of the crucial ways in which True Grit is fundamentally different to its forebear; their respective protagonists. In Hathaway's film, even though it was Mattie's story, it was John Wayne's show. Here, even though Jeff Bridges does a great job of making Rooster into a fairly disgusting, but hilarious, human being who is hard to ignore, Haillee Steinfeld is undoubtedly the star. She plays Mattie with the right mix of fiery, Presbyterian self-righteousness, fierce intelligence and childish petulance. We never doubt for a moment that Mattie has the strength to see Chaney brought to justice, or that she is the smartest person in any given room, whether she is bartering, laying a verbal lashing upon the pompous Texas Ranger 'LaBeef' (Matt Damon) or staring down 'Lucky' Ned Pepper (Barry Pepper, who eerily mimics R0bert Duvall's voice and mannerisms from the original). 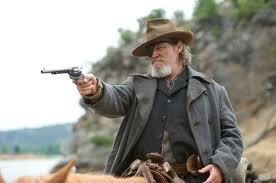 The Coens understand that the true grit of the title does not, in fact, refer to Rooster Cogburn. Working with their longtime cinematographer Roger Deakins, The Coens also manage to create a believably harsh and dangerous world, one that presents a suitable challenge to so formidable a team as Mattie, Rooster and LaBeef. It's a film of rich, autumnal forests and bleak white landscapes that complement Mattie's story, which is as much a coming-of-age tale as a Western. There is a real sense of an age coming to an end, as the frontier was in the 1870s, and that things will never be the same, much as Mattie will be irrevocably changed by her experiences. What's interesting about True Grit is that The Coens have made easily their most accessible film, a mere twenty-six years into their career, yet they don't seem to have compromised in doing so. The film lacks many of the self-conscious tics and exuberant camerawork that typifies their most distinctive work, yet at the same time the tone of the film, which is by turns laugh out loud funny and darkly meditative, is completely and recognisably theirs. This is at least in part because Portis' novel, much like Cormac MacCarthy's No Country For Old Men, is so suited to their style and voice that they can happily get out of the way and focus on telling a good story. The result is a fairly conventional Western that is told in a distinct and unusual way, one which allows for the odd rhythmic speech patterns, bizarre facial hair and outbursts of sporadic, bloody violence that have become their trademarks but which does not allow those quirks to overshadow everything else. Whilst it might not have the thematic depth of some of The Coen Brothers' best films, True Grit is easily one of their most entertaining. It's a timeless Western story told with effortless grace and razor-sharp wit, and which is filled with moments of real visceral power. It may not be a masterpiece, but it is tantalisingly close.